Travel to Kolad for a thrilling adventure of river rafting and stay overnight at a gorgeous campsite. Here, you and your group of friends can enjoy activities like air rifle and pistol shooting or outdoor games like volleyball and badminton. In the evening, you'll gather around a campfire to enjoy a merry night outdoors. The next day, it's time to go rafting! You'll gear up with life jackets and helmets, jump into inflatable rafts and spend two hours battling the rapids of Kundalika. Paddle your way over gurgling tides for a 12-km stretch on the river and get drenched with the cool river water. Kolad, a small village on the banks of the Kundalika River, is a popular destination for river rafting adventures. 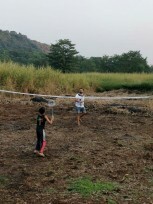 Accessible via a short drive from Mumbai and Pune, the campsites of Kolad are visited by hundreds of travellers every week looking for a fun, outdoor adventure. In the monsoon, the rain water adds to the flow of the Kundalika and turns the village into a lush green paradise of nature. In the winter, the chilly winds make evening bonfires the perfect way to spend the night. You'll be staying in air-conditioned, villa rooms. You'll sleep on a queen-size double bed with spring mattresses. The attached washroom comes with hot and cold running water and a bathtub. This package also includes delicious, buffet meals served at the common dining area. • Book an outdoor adventure and go rafting in Kolad. • Gather your friends or family together for a fun getaway. • Enjoy an evening bonfire at the campsite. • Enjoy a 2-hr river rafting session on the Kundalika. • Dig in to delicious locally-prepared meals. Smoking is strictly not allowed outside designated smoking areas at the campsite. 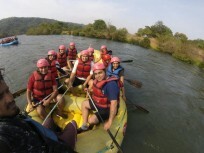 For cancellations made 7 days or more before the check-in for this Kolad rafting trip: 95% refund. For cancellations made 2-7 days before the check-in for this Kolad rafting trip: 75% refund. For cancellations made less than 2 days before the check-in for this Kolad rafting trip: 50% refund. Kids younger than 5 years of age stay for free. More than 2 kids younger than 5 years of age are charged INR 1,300 per person. Kids between the ages of 5-10 years will be charged INR 1,300 for stay with meals, but will not be allowed to do rafting. You can check in any time after 15:00 hrs. Have a cup of tea and some snacks, and then choose from a list of activities that you can enjoy at the campsite, including air rifle and pistol shooting, volleyball, cycling and more. In the evening, you'll enjoy a bonfire and some relaxed, fun time with your friends or family, around the crackling campfire. Enjoy a hot dinner at night, retreat in your villas for the night. Overnight in AC villas at Kolad campsite. Stay at a picturesque campsite, surrounded by lush monsoon greenery. It's time to go rafting! After breakfast, you'll head out from the campsite and travel to the rafting start point. Here, you'll gear up with life jackets and helmets, jump into inflatable rafts and spend two hours battling the rapids of Kundalika. Return to the campsite for lunch and rest in your villa, until it is time to check-out. Your Kolad rafting trip ends here. Go rafting down the Kundalika River. All equipment required for rafting: safety helmets, jackets, paddles, etc. Overnight in AC Villa at Kolad campsite. You can check in by 15:00 hrs. The villa has an air conditioner, queen-size double beds with mattress and attached washrooms with running water. Today's meal package includes evening snacks and dinner. Lunch and dinner usually includes mix vegetable preparation, chicken or egg preparation, tandoori roti, daal, basmati rice and a sweet dish. Inside view of AC Villa rooms: queen-size double beds. Today's meal package includes breakfast and lunch. Breakfast usually includes an egg preparation, bread with butter and jam, upma or poha and tea. By 14:30 hrs, it's time to check out. Your Kolad rafting trip ends here. Common dining area at the campsite.